Detecting caspase-3 and then nuclear DNA in live cells. Direct addition into cell culture, followed by only 15-30 minutes of incubation with no wash.
DEVD-NucView™ 488 caspase-3 substrate is the first of a series of NucView™ caspase substrates developed by Biotium to follow caspase activity in living cells in real-time (Figures 1-5). We have invented a whole new concept to design fluorogenic enzyme substrates by attaching an enzyme substrate moiety to a functional dye, thereby making the functional dye nonfunctional. Upon enzymatic cleavage of the substrate, the dye restores its functionality and thus becomes capable of binding to its target to emit fluorescence (Figure 2). 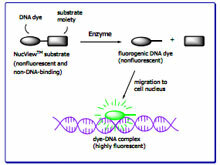 In the case of DEVD-NucView 488 caspase-3 substrate, a highly negatively charged DEVD peptide is attached to a DNA-binding dye to make the dye unable to bind to DNA and thus unable to produce fluorescence in the presence of DNA (Figure 6). The substrate can rapidly cross cell membrane to enter the cell cytoplasm, where it is cleaved by caspase-3 to release the high-affinity DNA dye. 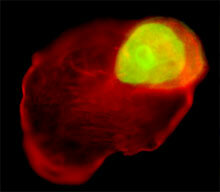 The released DNA dye migrates to the cell nucleus to stain the nucleus brightly green. Therefore, the bifunctional substrate allows one not only to detect caspase-3 within an apoptotic cell but also to stain the cell nucleus, which is known to undergo morphological change over the apoptotic process. As apoptotic cells within the same cell population may differ in the onset times for different apoptotic events, it is important to be able to follow these events independently in real-time so that the interrelations among the events can be better understood. DEVD-NucView™ 488 caspase- 3 substrate combined with other fluorescent probes from Biotium provides powerful tools for studying the temporal and spatial relations among the different events by fluorescence microscopy and/or flow cytometry (Figure 4). Biotium now offers two caspase-3 detection kits for live cells. Product #30029 consists of DEVD-NucView™ 488 caspase-3 substrate and a caspase-3 inhibitor in sufficient quantities for at least 100 assays by flow cytometry or microscopy. Product #30030 is a dual apoptosis assay kit consisting of DEVD-NucView™ 488 caspase-3 substrate and the red fluorescent sulforhodamine 101-annexin V for detecting phosphotadylserine (PS) translocation in quantities sufficient for performing at least 50 assays by flow cytometry or microscopy. Detailed protocols for using both products are downloadable at Biotium website. Figure 1. Staurosporine-induced MDA-MB-231 cells were first incubated with 1μM DEVD-NucView 488 caspase-3 substrate at 37oC for 30 minutes, followed by regular cell fixation in 3.7% formaldehyde. 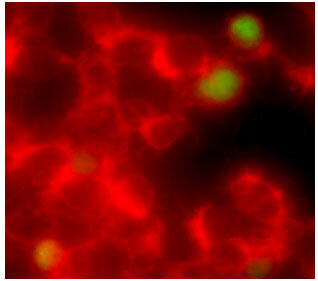 The fixed cells were then permeabilized and stained with sulforhodamine 101-phalloidin (Texas Red -phalloidin)(#00033). 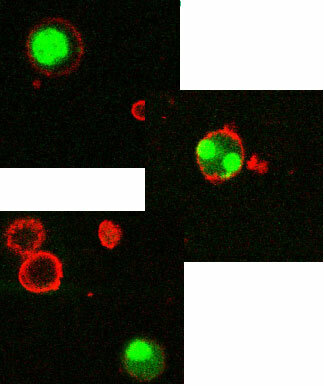 The nuclear DNA of the apoptotic cell was stained green by the enzymatically released DNA dye while the cell skeleton was stained red by the F actin-binding phalloidin. Figure 2. Scheme showing the principle of intracellular caspase detection using a NucView™ enzyme substrate. Figure 3. Apoptotic Jurkat cells successively incubated with sulforhodamine 101-annexin V (Texas Red-annexin V) (#29002) and DEVD-NucView™ 488 caspase-3 substrate for 15 minutes each. The annexin V stained phosphatidylserine (PS) on the cell surface red while the substrate was cleaved by caspase-3 to release a DNA dye that stained the nuclear DNA green. Figure 4. Flow cytometry detection of caspase-3 activity in Jurkat cells using DEVD-NucView™ 488 caspase-3 substrate following apoptotic induction with staurosporine for varying amounts of time (1h, 2.5 h and 5 h, respectively). Before each analysis, the induced cells were incubated with NucView™ 488 caspase-3 substrate (10 μM) for 15 min. Detected percentages of caspase-3-positive cells were 0% at time zero (no staurosporine induction as control) (red), 10% at 1 hour (blue), 80% at 2.5 hours (purple) and 97% at 5 hours (sky blue), respectively. Figure 5. Staurosporine-induced Hela cells were first incubated with 1μM DEVDNucView  488 at 37oC for 30 minutes followed by regular cell fixation in 3.7% formaldehyde. The fixed Hela cells were then permeabilized and stained with sulforhodamine 101-phalloidin (Texas Red-phalloidin)(#00033). Apoptotic cells were stained green in the nuclei by the enzymatically released DNA dye while all cells were stained red by the F actin-binding phalloidin. Figure 6. 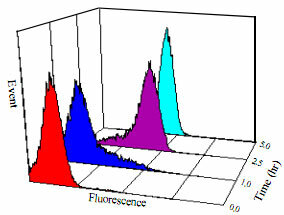 Titrations of NucView 488 caspase-3 substrate (1 μM) and its enzymatically cleaved product (1 μM) with dsDNA in pH 7.4 TE buffer as monitored by fluorescence at 530 nm (excitation at 475 nm) on a fluorescence microplate reader.